Kwan Yin is a goddess of compassion, whose name means “One who hears the cries of the world.” She is regarded as a feminine bodhisattva, an enlightened being. Her worship took its current form when Buddhism came to China. Spellings vary, with Quan Yin and Guan Yin common; in Japan she goes by Kannon. Very large statues of Kwan Yin are traditional in China, Japan, and many other Asian countries. Here’s a picture of a Kwan Yin Statue from Guangzhou, China. And here’s a website with many more very big religious statues. 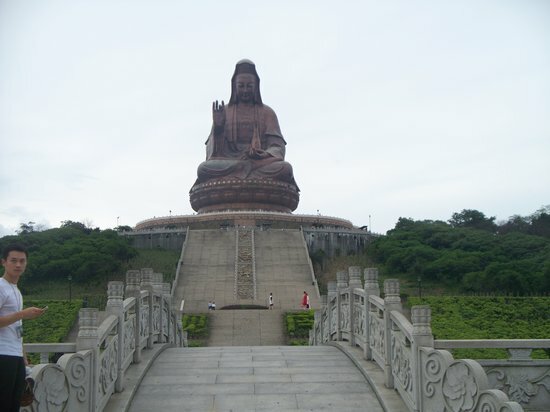 (In Asia, gigantic statues of Kwan Yin, Buddha, Shiva and others are common around temples and large cities.) As the female analog of The Buddha of Mercy, Avilokiteshvara, she’s loved by all. And that’s just a start–there are a lot of representations out there! In Feng Shui, it’s traditional to keep a small statue of her in each room of the house to maintain harmonious energy. Travelers and sailors also carry a small statue of her with them for safety and luck. Larger statues are common in gardens, as well as personal and family shrines. And representations of Kwan Yin in public areas, like the one linked above, are among the largest statues in the world. Back in Confucian China lived king, whose third and final daughter was so radiant that he named her Miao Shan (radiant goddess). The girl lived up to her name, preferring a life of contemplation, while renouncing fine food, clothing, and all other trappings of royal life. When it came time for her to marry, she adamantly refused. Where, she asked her father, was there a husband who could give her the gifts of the Buddha–freedom from the fear of sickness, old age and death? Miao Shan reminded her father that even a king had no protection from these things. The king didn’t like that much. In fact, he was so enraged that he put her into a Buddhist nunnery, threatening the nuns with torture and death unless they subjected his daughter to the harshest of treatment. Miao Shan willingly worked at menial tasks and suffered privation, though she chastised the women for fearing her father’s threats. Next, the desperate king decided to kill her. But when he tried to have her beheaded, a blinding thunderstorm came, and a tiger rushed in at the last minute and carried the girl away. The king decided to wait awhile before trying again, but before he could decide what to do, a terrible sickness came to him, reminding him of his daughter’s warnings about the things even kings fear. A passing beggar advised him that only a potion made from the willing sacrifice of two human arms and two human eyes could save him. Without much hope, he sent out his ministers in search of a person who would willingly give up arms and eyes. Miraculously (to them at least), they found such a person; the potion was made and the king saved. Of course, he was filled with remorse when he found out it was his daughter who’d been mutilated. She comforted her father with prophetic words: “Do not worry, Father. Mortal eyes give way to diamond eyes, and mortal arms to arms of gold.” He ordered a statue made of her, and in her honor he commanded that it have no arms and no eyes. But the sculptor misunderstood his words, and gave the statue instead a thousand arms and a thousand eyes. The king knew then that Miao Shan could do anything with so many arms, could see anything with so many eyes. Her compassion comforted him, and now he was willing to extend this comfort to all people. After she died and became the goddess Kwan Yin, she requested permission to come back to Earth, to be with us until the day when all suffering may cease.